Earlier this year, Marilyn Pharo awoke from a deep slumber to her Cardigan-Corgi whining and biting her nose. She got out of bed to let him out, only to discover that she was so hypoglycemic that she couldn’t stand. The dog stayed with her, agitated and whining persistently, until she was able to drink some juice and regain a normal blood sugar level. Then he calmed down, ready to return to bed. Pharo isn’t alone in this experience. A 2008 study found that 65% of dog owners with type 1 diabetes have been alerted by their dogs of at least one hypoglycemic episode. 32% were alerted eleven times or more. Sweating, shaking, and rapid heart rate. Feeling nervous, confused, or increasingly irritability. Long-time sufferers of hypoglycemia often develop hypoglycemia unawareness, or the inability to recognize symptoms of low blood sugar. Dogs4Diabetes continues a centuries-long trend of training dogs to assist humans with disabilities or medical disorders. References to dogs leading the blind date back to the sixteenth century, and the first guide dog training schools were established shortly after World War I. Most of the original owners of guide dogs were veterans blinded in combat. In the 1970s, NEADS (then called the Hearing Dog Program) began training dogs to help hearing-impaired persons. In the thirty years since then, dogs have been trained to help those bound by wheel chairs, assist people with autism, and detect impending heart attacks and seizures. Scientists aren’t yet certain why dogs are able to detect dropping blood sugar. Ruefenacht believes the dogs can smell a chemical change related to glucose imbalance. It’s also possible that the dogs recognize physical changes, such as sweating or increased heartbeat, that their owners are unaware of. Regardless of why it works, there’s no denying the results. The dogs trained by Dogs4Diabetes are 90% accurate when alerting their owners of dropping blood sugar. They can even recognize the danger before a testing kit can. Often when the dogs alert their owners of dropping blood sugar, the owners’ blood will test as normal, but when they test their blood again ten minutes later, their blood sugar has dropped dangerously low. Dogs4Diabetes’s dogs are “career change” dogs provided by the San Rafael campus of Guide Dogs for the Blind. Dogs that failed out of Guide Dogs for the Blind for minor issues such as avoiding puddles can be retrained in just three to four months to assist diabetics. Still, it costs Dogs4Diabetes $20,000 to train each dog. The only cost to the dog’s new owner is a $150 two-week training course and the normal costs of owning a dog. 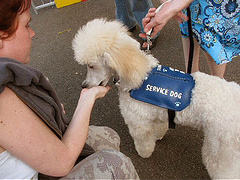 Like other service dogs, the dogs trained by Dogs4Diabetes stay with their humans 24 hours a day, 7 days a week. When their owners’ blood sugar starts rising or falling dangerously, the dogs alert them by holding a bringsel—a soft tube that usually hangs from their neck—and jumping up and down or nudging their owner. On several occasions, they’ve been known to alert complete strangers of dangerous blood sugar levels. The training provided by Dogs4Diabetes improves the accuracy and coherency of the dogs’ warnings, but dogs naturally act as caretakers for their owners. As Marilyn Pharo learned, a dog doesn’t need to be specially trained to be prepared to save his owner’s life.